The Raleigh Gun & Knife Show will be held next on May 4th-5th, 2019 with additional shows on Aug 3rd-4th, 2019, and Nov 23rd-24th, 2019 in Raleigh, NC. 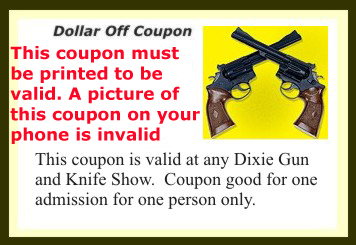 This Raleigh gun show is held at NC State Fairgrounds and hosted by Dixie Gun & Knife Show Classic. All federal, state and local firearm ordinances and laws must be obeyed. Excellent venue and location…great vendors and atmosphere. Missy has the best gun shows.